^ Quickfacts.census.gov - Jackson County - accessed 2011-12-06. 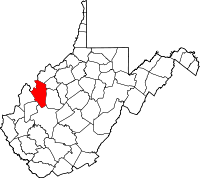 ^ American FactFinder - Ripley, West Virginia - accessed 2011-12-06. ^ American FactFinder - Ravenswood, West Virginia - accessed 2011-12-06. ^ West Virginia Atlas & Gazetteer. Yarmouth, Me. : DeLorme. (1997). pp. 32–33. ISBN 0-89933-246-3.